Attached of the J.C. Kerr is a bit scuffed and scruffy, but an interesting photo. 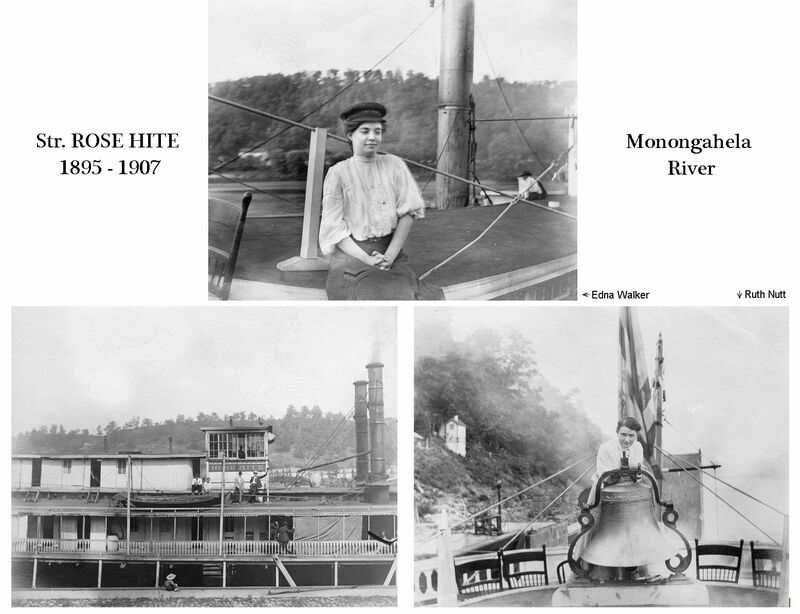 The boat was built in 1884 and operated on the upper Ohio until 1892 when she moved to the Green River trade where this photo was most likely taken. In 1894 she was rebuilt a bit and renamed Chaperon which she is better known by. 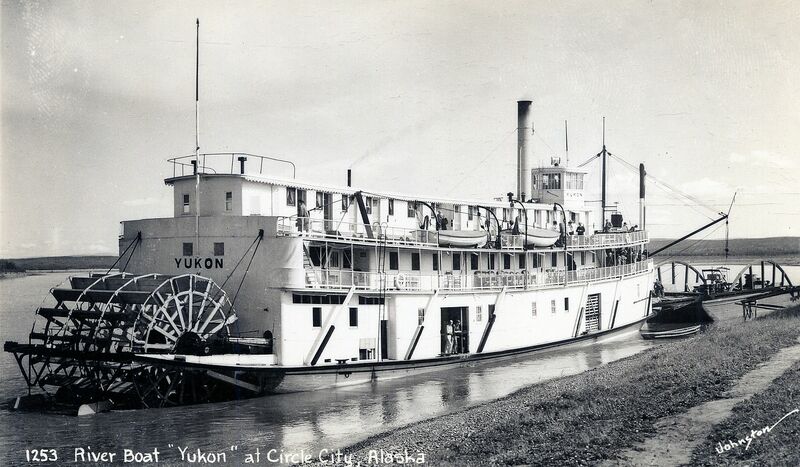 In 1917 she ended up on the Yazoo and tributaries, renamed the Choctaw. Burned on the Tallahatchie in 1922. 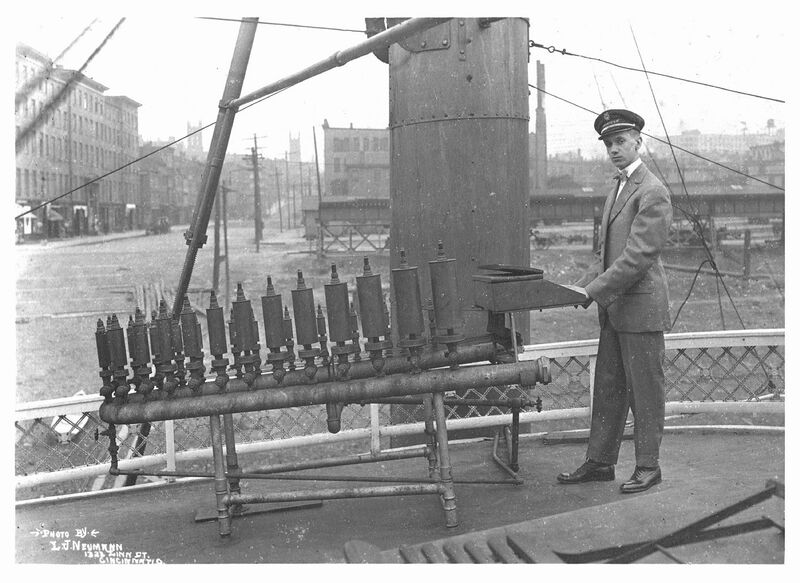 This was taken aboard the Princess, photo by Lawrence J. Neumann, 945 Gest Street, Cincinnati. 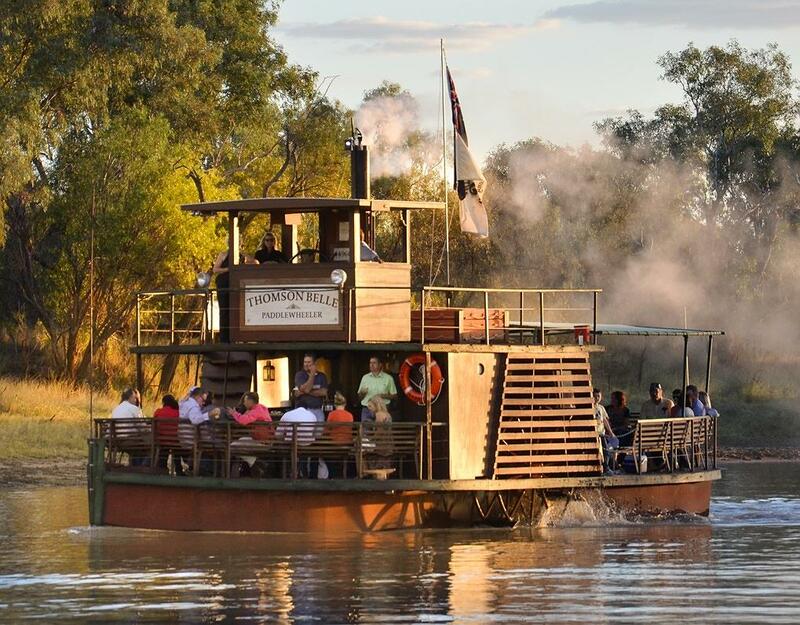 This is the original Thomson River Sunset Cruise, which includes Starlight's Spectacular Sound & Light Show and a stockman's dinner around the camp-fire. Take a gentle cruise at sunset down the peaceful Thomson River on the only paddlewheeler west of the Great Divide or on the Thomson Princess Riverboat. Then, join us for traditional stockman's camp-fire dinner followed by bush poetry with local outback storyteller. Afterwards marvel as the riverbank is lit up with Starlight's Spectacular Sound & Light Show - a unique big-screen presentation featuring the Kinnon & Co family and locals in the amazing adventures of the notorious local cattle thief known as 'Captain Starlight'. Finally, in the atmospheric surroundings of the bush at night, enjoy the timeless favourite—billy tea and damper. Transfers to and from accommodation. 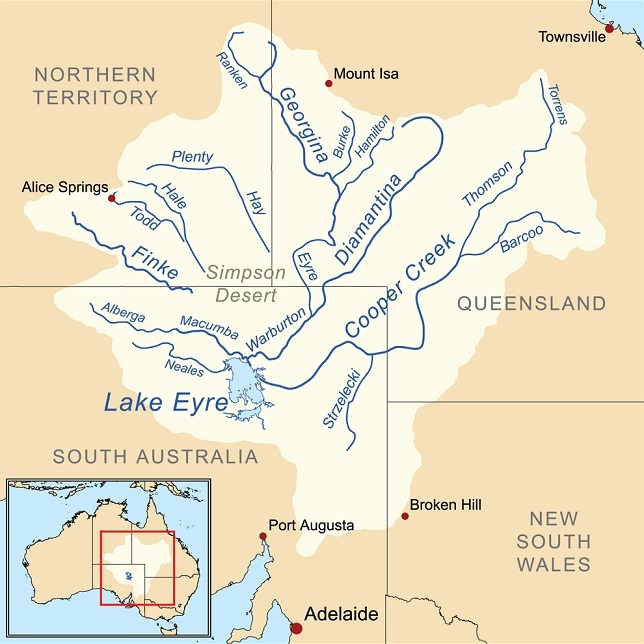 The Thomson River is situated in western Queensland, Australia, and forms part of the Lake Eyre Basin. The river was named by the explorer, Edmund Kennedy, in the 1840s. The northernmost headwaters of the river begin as Torrens Creek, inland from Charters Towers. The watercourse becomes the Thomson just north of the town of Muttaburra, where the channels of Landsborough Creek, Towerhill Creek and Cornish Creek meet. Aramac Creek joins the river from the east, south of Muttaburra and Maneroo Creek flows from the west, joining the Thomson south of Longreach. Just to the west of Longreach the river is crossed by the Landsborough Highway. The river continues in a south westerly direction, passing the towns of Longreach, Stonehenge and Jundah, before joining with the Barcoo River north of Windorah to form Cooper Creek. This is the only place in the world where the confluence of two rivers form a creek. As with all of the rivers in the Lake Eyre Basin, the waters of the Thomson never reach the sea, and instead either evaporate, or, in exceptional flood, empty into Lake Eyre. Floods are relatively common within the catchement because of the summer monsoon rains. Due to the flat nature of the country traversed, the river can then become many kilometres wide, causing major difficulties. For much of the time, however, the river does not flow, and becomes a line of billabongs. The area through which the river flows is semi-arid blacksoil plains. The main industries of the area are sheep and beef cattle. 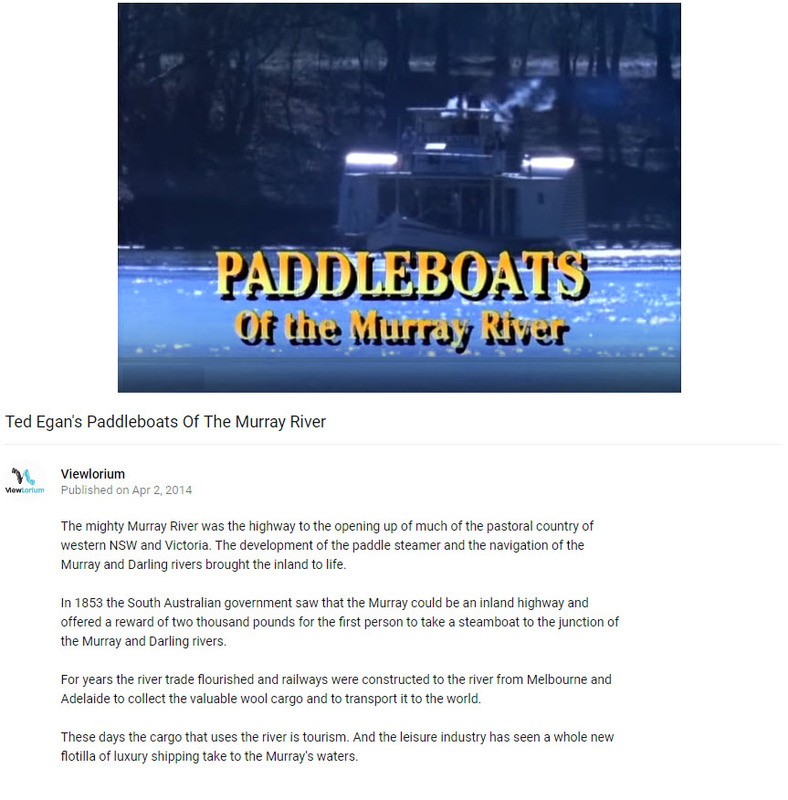 This Australian "doc" on Murray River steamers has its moments such as the memories of a vintage lady who had been a cook on a boat in "the old days." This runs under an hour. Here is the second T.P. LEATHERS built in 1891 (the first one built in 1885 goes with the 1888 New Orleans wharf keepers log book). Way's Packet Directory Number 5287Built in 1891 at Howard Ship Yard in Jeffersonville, Indiana459 TonsThe original price was $42,500 and the home port was New Orleans.This cotton carrier had red smokestacks, as did all of the NATCHEZ side-wheelers, a custom which continued until August, 1898 when her stacks were painted black.Captain T.P. Leathers died while this boat was in operation and command and management went to Captain Bowling Leathers and Captain W.A. Duke. The T.P. LEATHERS was snagged in June, 1900 at Bougere's Landing about 40 miles above Natchez, Mississippi and lost. The T.P. LEATHERS was named for Captain Tom P. Leatherswho was born in New Orleans on May 24, 1816, died June 13, 1896. The GENERAL QUITMAN in partnership with John W. Cannon, the NATCHEZ (1853-February 1854), the NATCHEZ (1860-March 1863),T.P. LEATHERS I (1885) and T.P. LEATHERS II (1891).In partnership with Captain Truman C. Holmes, Leathers owned: the PRINCESS, the C.C. JUNIOR, the R.W. McREA and the CAPITOL. 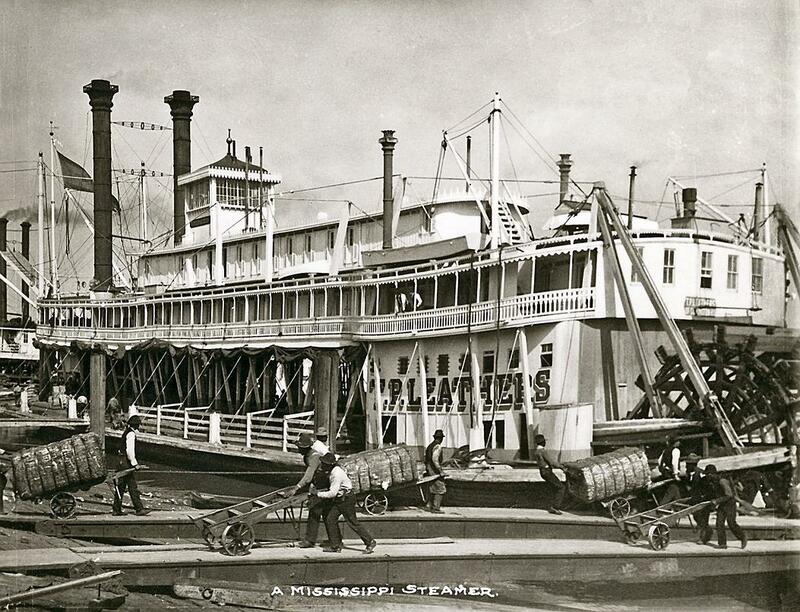 The GENERAL QUITMAN (1868), the MAGENTA (1864), the sidewheel NATCHEZ and the sternwheel NATCHEZ. In the winter of 1868 he was captain on the BELLE LEE. A fight regarding the terms of the charter of the BELLE LEE ensued between Captain Leathers and Captain John W. Cannon and from that point on Leathers was regarded as an enemy by Captain Cannon. Leathers held stock in the packet MAGENTA at various times. He was captain of the NATCHEZ when she raced the ROB'T E. LEE in June-July of 1870. Excellent photo of the W.H. GRAPEVINE from the La Crosse Collection. Perfect camera angle, focus, contrast and grayscale values. Wonderful reflection, all together the picture is a "beauty to be prized." Machinery and part of the upper works came from the J.A. WOODSON. Named for Captain William H. Grapevine, superintendent of Missouri-Pacific's transfer boats. She was designed to run on the White River in Arkansas to connect with their trains. After a short time there, she went to the Missouri River and ran St. Louis-Rocheport. In 1900 she ran excursions at Kansas City under charter to A.F. Baughman. 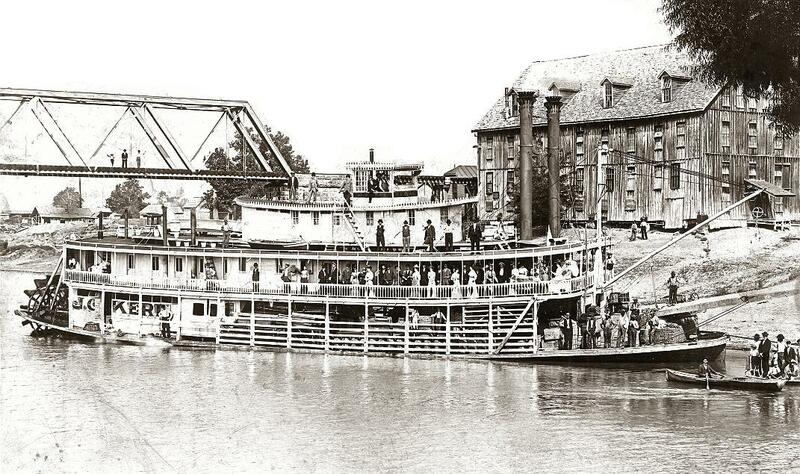 After being sold to Captain Davis in 1903, she ran Cincinnati-Ironton, Ohio. During the 1903 flood, she saved the lives of 200 stranded river dwellers and property estimated at two million dollars. She broke loose in ice at Cincinnati, struck the C. and O. Railroad bridge and sank on December 25, 1903 sank in December 1903. Her machinery went to the Big Sandy boat ECLIPSE. Used at Bismarck, Dakota in the beginning. 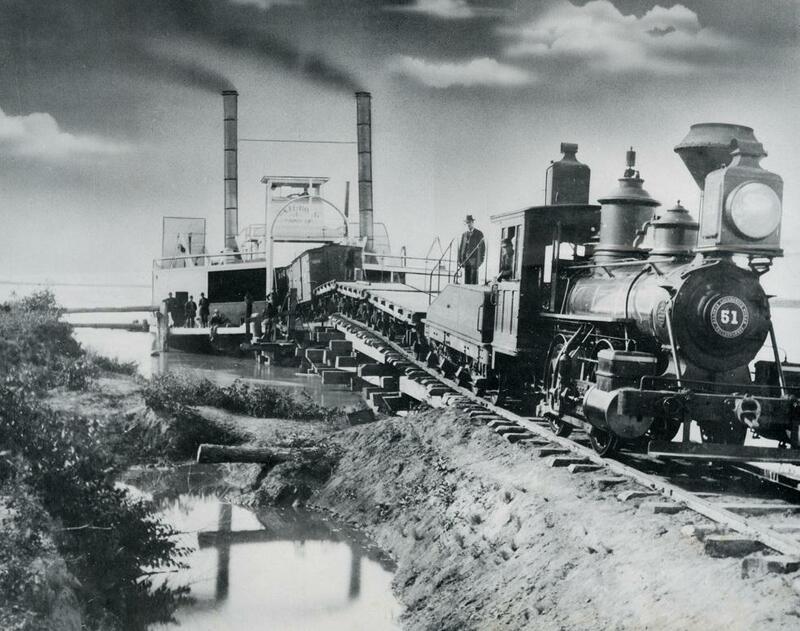 Later she went to Vicksburg, Mississippi and was operated there by the Vicksburg, Shreveport and Pacific Railroad. She and the packet R.L. COBB were beached in a flood at Vicksburg and both rotted down on shore early in 1895. The NORTHERN PACIFIC was replaced by the transfer ferry DELTA. Scanned from a "retouched" photo (note air brushed clouds in the sky and definition lines drawn around the paddleboxes and stacks to increase their visibility). The signage on the front of the pilot house says: "RAIL-ROAD TRANSFER" This was probably published to be used for educational purposes in classrooms, image area without margins measures 16 x 20 inches. "Train using ferry to cross the Missouri River at Bismarck, North Dakota during the summer. In the winter the train crossed the river on tracks laid on ice." 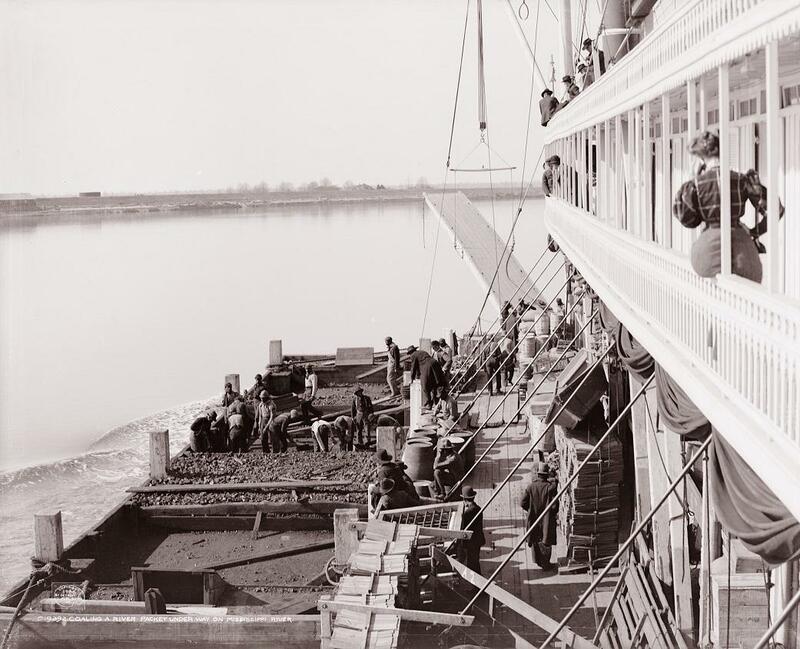 "Coaling a River Packet Under Way on the Mississippi River"
(Refueling a steamboat from a barge carrying coal). From the Library of Congress digital collection. Judging from what can be seen of the port side smokestack it is probable that the steamboat was Captain La Verrier Cooley's AMERICA (1898-1926). Columbia excursion steamer. Nice nostalgic flavor and old Mr. Toad's style of "motor car" with what look like carriage wheels. Very dreamy landscape and depth to it. 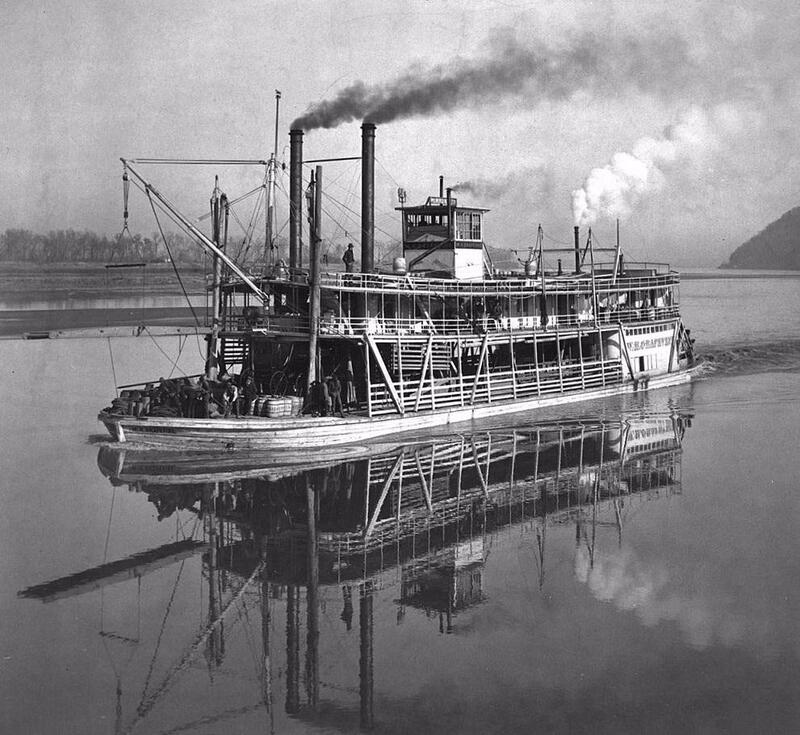 The boat sank near Columbia on the Illinois River in 1918 with the loss of 175 lives. Sounds like the pilots may have been entertaining some sultry vixens instead of watching the river. On July 5, 1918 the Columbia was steaming back from Al Fresco Park in Peoria to Pekin and wrecked near Wesley City (now Creve Couer). 89 lives were lost. There were some accusations that the pilot was drunk. Descendants of Captain Mehl still live in the area as do descendants of people on the boat that night. I believe the last survivor died a few years ago. 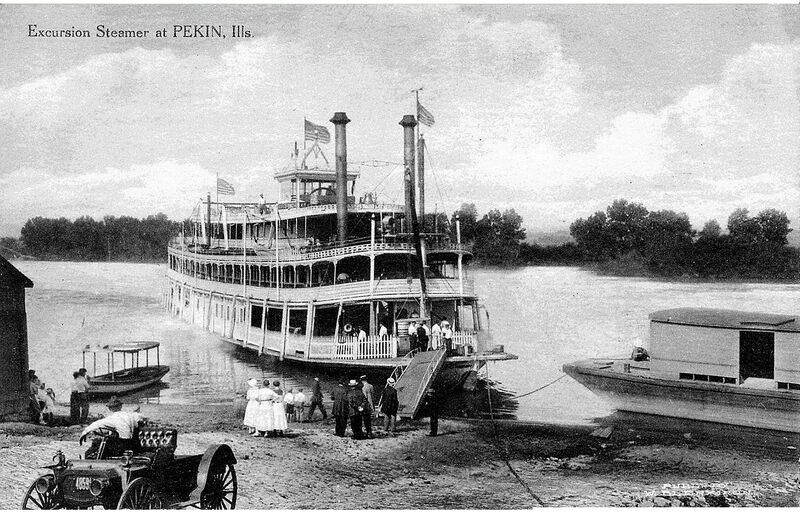 The Peoria Historical Society has some pictures of the Columbia and other Peoria boats (the Swain boats in particular). Some pictures of other boats passing through as well. I just ran across some in some of my wife's family pictures as matter of fact. At any rate great collection. Sure looks inviting, what a nice vacation vehicle . . .